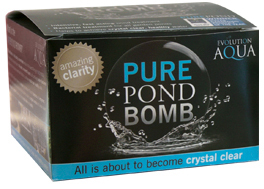 PURE Pond Bomb is a fast acting, concentrated version of the Award Winning PURE Pond. Simply drop the PURE Pond Bomb into your pond filter or directly into the water. All is about to become crystal clear ! This new product now sits alongside the award winning PURE Pond Bomb and PURE Pond to make a full product range that should be added to every pond keepers’ armoury. PURE Pond Bomb is there when you need a fast acting boost of bacterial activity in your pond, such as when you have introduced new fish, or had issues with you filter and your ammonia and nitrite levels need to be rapidly corrected. PURE Pond is ideal to be used as an “all season long” maintenance product for all types of ponds to maintain clarity and to keep Ammonia and Nitrite levels under control. The new PURE+ Filter Start Gel is then used when brand new filter media needs maturing. The PURE+ Filter Start Gel is well suited for use in bead filters, particularly Evolution Aqua’s K1 Micro Bead filters to speed up maturation from day one – but is equally effective when spread on japanese matting, conventional beads and other types of filter media. PURE+ Filter Start Gel is available in 1 Litre. Evolution Aqua Stop Sludge Liquid quickly breaks down the organic waste which can coat all of the surfaces in your pond, pipes and filters. Evolution Aqua STOP Sludge Liquid contains enzymes and bacteria which will aid the decomposition of organic waste (sludge). STOP Sludge is 100% environmentally friendly and is not harmful to humans, plants or animals. Sludge uses up available oxygen in your pond. Evolution Aqua STOP Sludge Liquid helps to remove this harmful by-product and should only to be used for the treatment of sludge build-ups in fish/Koi ponds, their pipe work and filter systems. Contains no harmful chemicals. Safe for all fish, water plants, lilies and invertebrates. Evolution Aqua Stop Sludge Liquid removes organic waste (sludge) that settles on all surfaces of your pond, pipes and filters ..
Evolution Aqua Stop Sludge Liquid is very simple to use and is 100% environmentally friendly and is not harmful to humans, plants or animals. Evolution Aqua Stop Sludge Liquid Stop Sludge contains the correct balance of several groups of bacteria that are best suited for the decomposition and removal of all organic waste - this typically settles on your pond floor, pipes and filters, where inadvertent dead spaces are created. Sludge demands oxygen as it decays, therefore reducing the available dissolved oxygen in the water which the fish and beneficial bacteria depend on. Sludge creates dirty areas that can affect water clarity and create unpleasant odours. It also provides the perfect environment for harmful bacteria which can cause severe health problems for your fish. By removing sludge using Evolution Aqua Stop Sludge Liquid you increase your oxygen content, clarity and general condition of your water. Fish health undoubtedly will benefit.